This shade is sooooo 80s and I really, REALLY love it! Seriously!!! It is thee perfect bright pink polish. This was a Christmas gift, along with 3 other Revlon Parfumerie polishes. (Thanks Dan!) If there's one thing Revlon knows how to do well, it's knocking red and pink polishes waaaaaay outta the park. African Tea Rose is an incredibly pretty, slightly blue-toned bright pink with a very faint purple shimmer. (And, yes. I'm back to my Cybershot! Could you tell?) It's brighter and more neon in my pictures, but this pink definitely leans a bit more blue in real life. You can see the shimmer pretty clearly in the bottle, but on the nails, it's much more subtle. It adds a glowing softness to the color that actually came across very well in my photos, despite the color non-accuracy... So, so pretty! The scent on this one is obviously rose, and it's fitting when I think about it. It actually reminds me of toy makeup from the 80s. You know... half plastic, half rose? :) Anyway, the rosiness was pretty strong when I finished painting my nails last night, (during commercial breaks of PLL...) but by this morning, the scent had really faded. I can't complain. I'm not the biggest fan of rose-scented anything. I could've easily just painted African Tea Rose on my nails and been done with it, but I decided to do another accent mani with Your Present Required. I know, I know, been there, done that... but I loooove the way it looks with African Tea Rose. And everything's better with sparkles, right? Right! 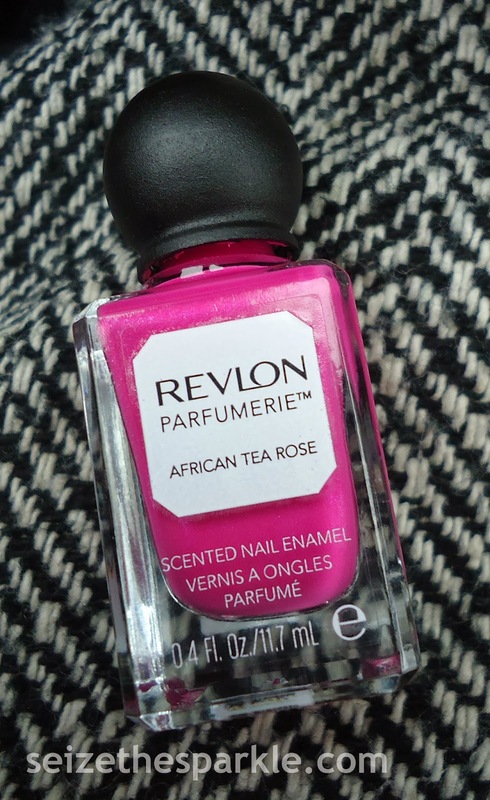 What do you think of African Tea Rose?